Haute Whimsy: Don't Be Late for THIS Important Date! 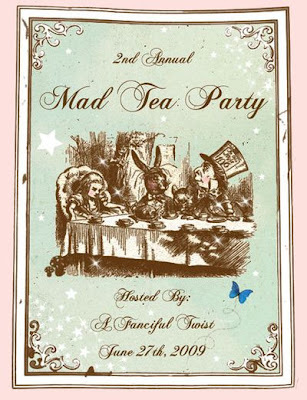 A Fanciful Twist is hosting a Mad Tea Party for bloggers on June 27th! Click on the flier to view the details of this whimsical party! Jen I bet your father was so happy to talk to his beautiful daughter. I love Vanessa, isn't she just like magic. I love Jen, because she is just like magic too. That sounds really interesting a fun! Oh, I'm off to check it out. how cute - i'm an "Alice" lover!! I love her blog / artwork. it's actually been ages since I visited her blog. Thanks for pointing me over once again.